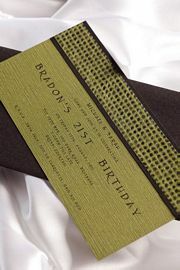 The "Colorado" invitation is a contemporary DL card with a modern mixture of brown and green metallic paper complimented by a feature strip of ribbon. 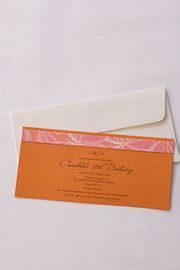 The "Papaya" invitation is a modern DL flat card with a matching translucent feature strip. 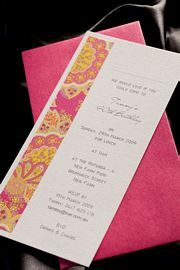 The "Tammy" invitation is a modern DL flat card with a designer paper feature strip. 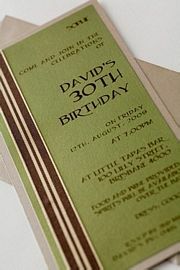 The "Midori" invitation is a modern DL flat card in bold colours. This invitation features textured paper with a layered feature pannel. 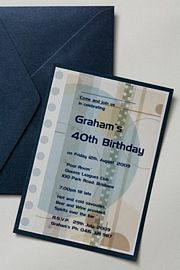 The "Mars" invitation is a three layer C6 blue card with a modern translucent overlay. The "Geisha" invitation is a modern DL card featuring a broad cut patterned panel combined with a mixture of red and green metallic paper.